Why you need to start now! Check out this article in the Stapleton Front Porch about Samantha's Spanish classes! In this unit we will explore Life on the Ocean! 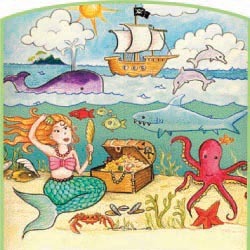 Whales, mermaids, pirates, sharks, submarines, octopi and little crabs - what an adventure in language! Along the way we'll learn about playing on the beach, what animals eat, clothing vocabulary, counting, colors, and plenty of functional phrases. The camp is $230 and includes a snack. There will be lots of music, singing, and art projects. The Music Lingua children's program is the premier educational kid's activity in the Stapleton/Lowry area! Music, language and fun - sign your child up today for a Music Lingua language class! Samantha is a lifelong learner with a passion for languages, music, and travel. Currently teaching high school Spanish full time, she has taught a variety of ages in subjects including Spanish, Italian, and ESL. She lived in Italy for 5 years and traveled extensively in Spain and Mexico. As a mother, she was looking for a fun way to blend music and Spanish and is thrilled to have found Music Lingua. Samantha is certified to teach K-12 with a specialization in Linguistically Diverse. She has a master's in second language acquisition from University of Delaware and a master's in Spanish from CU Denver.